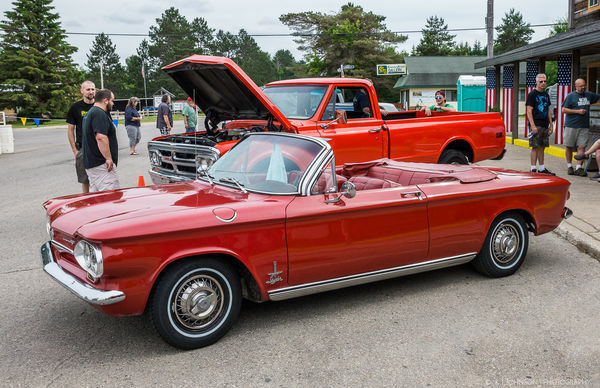 I had a 1960 Corvair coupe. Flipped it doing 85 on Rte. 80 near Hazeltown, PA back in 1967. Landed on it's side and walked out the windshield. Just looking at these photos makes me nervous. Any pix of the engine? There's a turbo charged emblem on the hood. Fun cars, especially the turbo (wasn’t it 180 BHP? ), but the swing axle rear suspension of the early ones (same as the VW beetle and Triumph Spitfire) could result is some “strange” handing, and the brakes (small drums front and rear as I recall) we’re totally inadequate, even for a light car. My brother had one of the later ones with the 4 carb, 140BHP engine which I was looking at to use as an autocross car, but after looking at the front brakes (which would have been very painful to upgrade, I decided against it (remember the old racer’s adage: “you can only go as fast as you can stop”). As I recall (correct me if I’m wrong), the later cars got rid of the swing axle rear, and were much more predictable. Don Yenko (SCCA racer) created a highly modified version (with an oil cooler on top of the rear fender) called the Yenko Stinger, which I saw race at VIR in the 60s. the engine on a '61 Corvair was "suspended" by 3 bolts (count'em...3). Two toward the front and 1 in the rear. I was driving across some railroad tracks one rainy night with a date, and suddenly the gas pedal collapsed full to the floor and a shower of sparks was spraying out the rear like a rooster tail. I slammed on the brakes and my date said in a quivering voice...."what happened?". As calmly as I could I replied, "I think our engine's missing". After I had it towed to the local Chevy dealer, they lifted the engine and replaced the sheared rear bolt for $7.50 and said "you were lucky, usually when they do this it shears all the electrical wiring." put a "for sale" sign on it the next day. 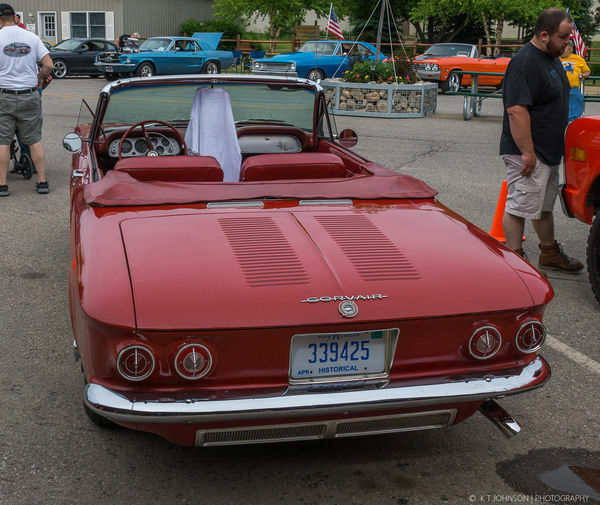 I loved my Corvair, it was a fun car to drive. It sat six adults, got 25 MPG, had a good sized trunk, and it was fun to drive. If they were made today, I'd buy one. Great little cars. Nice shots of “unsafe at any speed." 65 & 66 rear suspension used "half shafts" and 4 "U-Joints a bit different from the earlier models using an articulating outer bearing and 1 U-joint. I replaced a 61 Corvair Monza engine and trans with a Turbo Spider and 4 speed trans. Talk about unsafe, we ended up limiting throttle opening to approx. 50% to make it somewhat safe to drive.